The temperature is dropping, winter is on the way, so now is the time to plant tulips. Garden designer P. Allen Smith provides some gardening tips on The Saturday Early Show that will pay off in the spring. 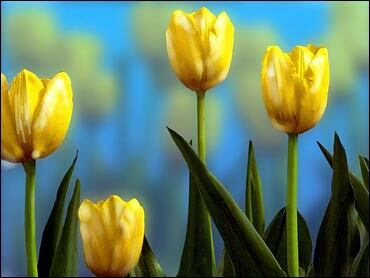 Tulip bulbs are one of the most popular spring flowers. To have them bloom in your garden during the mild weather of spring you have to plant them during the fall. Smith thinks tulips are at their most dramatic when planted in drifts of all the same variety or in the same color family. Smith generally plants his in clumps of 15 to 20 bulbs. Some good companion plants for tulips are cool weather annuals, such as pansies and violas, because they bloom close to the ground. Like most flowers, tulips show themselves off better when planted against a backdrop of other plants, like perennials or a low hedge. Smith plants tulips in his garden by digging out an area the size of the drift of blooms he wants. A good rule of thumb for the depth is to cover them 3 times the width of the bulb. Always work in good, rich compost and bone meal before placing the bulbs about 6 to 8 inches apart and then cover them with more soil. When choosing tulip bulbs, Smith suggests you think about color. There are endless combinations of tulip colors to choose from. Smith prefers to pick tulips from the same color family. Another important thing to consider is bloom time. Some tulips bloom early in the season and others bloom later. Smith suggests grouping together tulips that bloom at the same time. Now, if you are going to go to the trouble to plant tulips, you'll also want to take steps to protect them from garden pests such as gophers or squirrels. Smith uses chicken wire on his garden. Once the hole is dug Smith cuts a piece of chicken wire roughly a foot longer and wider than the hole. Then he folds the sides creating a wire basket that's six-inches deep. Next, place the wire cage in the hole. It would take one tough gofer or squirrel to chew through this wire cage. If you have a problem with dogs or other animals digging into your bulb plantings, place a piece of chicken wire just below the top soil over the bulb. Just remember to remove it before the bulbs begin to emerge in the spring. Smith prepares the area where he wants to plant his bulbs with a blend of 50-50 compost, topsoil and a little bone meal. Then he places the bulbs about six inches apart and covers them with the remaining soil. Using wire does add one more step to the planting process, but at least you know the bulbs are safe and sound. As a garden designer, Allen has learned that having a dark background for your tulips really makes the flower stand out. This dark background can be a fence, a wall, a hedge, or even a colorful shrub. A big misconception about tulips is that they don't come back year after year. Actually, tulips are perennial in their native environment in central Asia. In American gardens, tulips don't come back with the same vigor because the foliage dies back too soon, particularly in the south. It's this foliage that reinvigorates the bulbs; without the foliage dying back naturally, there's little chance of the tulip coming back. As for southern gardeners, the modern hybrid tulip is considered an annual. You have to plant it each year, but Smith feels it is worthwhile.